– Beat the egg and milk together. – Soak the walnut bread in the egg-milk mixture. – Heat pan and add butter. – Add soaked bread to pan and cook till nice and golden brown. – Place bacon in the same pan and fry until crispy. 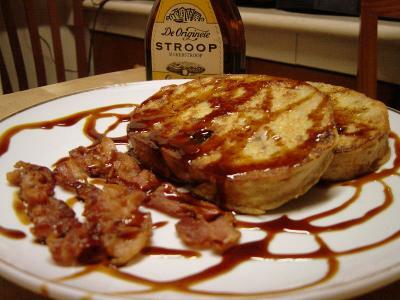 – Put everything on a plate and drizzle generously with Stroop. That sure hit the spot! That was a super description of Stroop! Comparing it to piyaya really made me imagine what it must taste like. I’m intrigued! Lovely breakfast you have there, Joey! Sort of reminds me of the stroopwaffel-and-bacon breakfasts I wolfed down in college where there was hardly any time for a proper breakfast. Stroop rules! 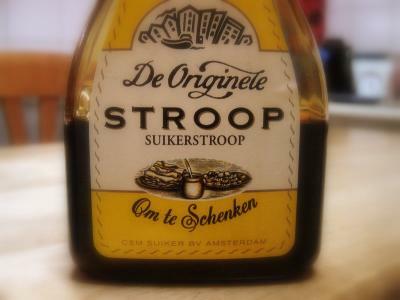 ive never had stroop but you have now gotten my interest piqued. looks really good. oh man. Hi! I actually live in Holland, and i love stroop too. You defenitely have to try it on brown beans, it is a dutch classic dish. That french toast looks great. I have never heard of Stroop before. Gotta love all the many international variations of classic dishes. Hi bakingfreak! Thanks for dropping by! I have actually tried it on beans (since they put brown sugar in baked beans, I thought why not stroop). I didn’t know it was classic dutch dish though…pleasant surprise 🙂 I want to try another of my favorite dutch treats soon: OLIEBOLLEN. You wouldn’t happen to have a recipe? 🙂 Sigh…I miss oliebollen, bitterballen, and dutch pancakes! And Albert Heijn, haha! Yes, i actually do have a recipe of oliebollen. I’ll post it on my recipesite, ok? It will soon be on there.